Ongoing Burma Army offensives in Shan and Kachin State are blocking key armed groups from signing a Nationwide Ceasefire Agreement, the community based organisation, the Women’s League of Burma warned. 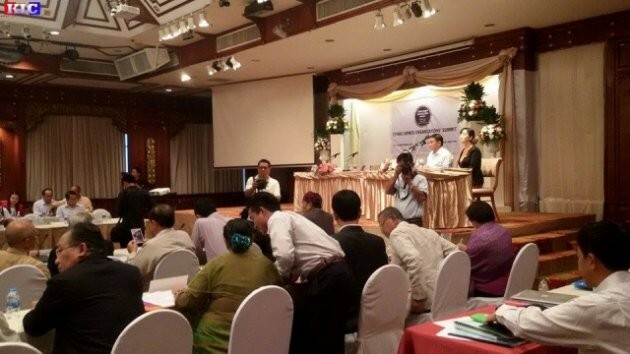 The NCA is set to be signed on October 15, but only eight armed groups have decided to sign it. “We do not trust Naypyidaw’s [government’s] peace process. It’s clearly just a game to divide the ethnic groups, while continuing to attack them,” WLB’s Naw Wahkushee said in a media statement, “The NCA is not only non-inclusive for the ethnic groups, it’s also non-inclusive of women,” she said, referring to the Nationwide Ceasefire Agreement. In recent weeks, villagers have documented attacks, killings, the use of torture and ‘disappearances’ by Burma Army forces. In September two villagers were killed in a Burma Army attack on their village in Southern Shan state. Villagers said that one of the killings was perpetrated in cold blood, with a 56 year-old woman was shot in the back. “They [Burma Army] fired shells indiscriminately into the village, injuring four men and two women; one of the men later died from his wounds. On entering the village, they kicked and beat one of the injured villagers, whose leg later had to be amputated, and deliberately shot dead an elderly grandmother,” a villager was quoted as saying in a statement released by the Shan Human Rights Foundation. The human rights organisation Physicians for Human Rights has released a report this month uncovering the widespread displacement of civilians to make way for development projects by the Burma Army. The report said that at least 8,000 civilians were affected and many had lost possessions and their livelihood in the move. International and regional human rights groups have estimated that hundreds of thousands of civilians have been displaced by the conflict in Northern Burma.